There are various posts in the Microsoft Technet File Systems and Storage forum (and other forums) indicating slow file copy/transfer speed. The details vary, but most of them involve either Windows Server 2008, Windows Server 2008 R2, or Windows Server 2003. This document is an attempt to coalesce all the various solutions into a single place. Note that the author of this document has not personally tested any of the solutions, but various posts in the forum indicate these to have solved the problem for some users. Symptom: File copy or File transfer speed is slow, either to a local drive or a network drive, especially so when a Windows Server 2008 or newer Windows file server is involved. If one of the drives involved in the file copy is an external USB drive, ensure that you are using the USB 2 protocol and not the older slower USB 1. Start Device Manager, find USB Controller, clock USB2 Enhanced Controller Host, and right click properties; make sure it is enabled. Repeat these steps for all USB2 Enhanced controller hosts. With Windows 8, Microsoft is significantly pushing the envelope on Windows Server performance and high availability with Windows 8, while also enabling these features with low cost Network Attached Storage. Windows 8 will support Hyper-V and SQL storing VHD files on an SMB 2.2 NAS share. A new File Server Remote VSS Protocol will enable shadow copy based backups (and restores) of these NAS shares. A Storage Services protocol that provides for scenarios such as creating modifying volumes and shares, creating and managing shadow copies, etc. Notably absent so far is a new Witness Notification Protocol document that forms the basis for high availability NAS shares and is the basis of the highly significant enhancements to have clients transparently fail over to new servers/shares as needed, without needing to re-open files. Presumably, this document and other remaining documents will get posted soon. Caveat: While efforts are made to make the content accurate, you peruse the contents of this blog at your own risk and responsibility. Any actions you take, or do not take based upon the blog contents are also your own responsibility. Microsoft has strived to improve NTFS resiliency and availability through the various versions of Windows. 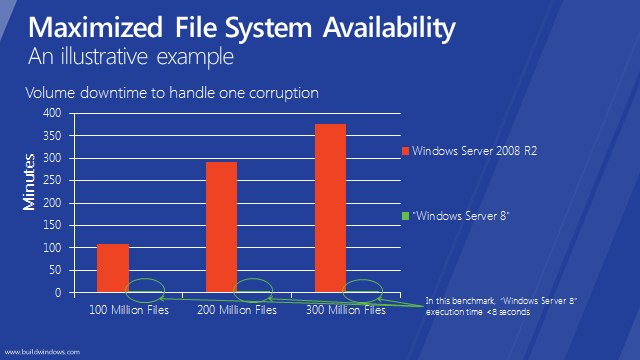 This post focusses on one aspect: the availability of an NTFS volume when corruption is detected. Prior to Windows Server 2008 R2, when an NTFS volume corruption is detected, the volume is taken offline and a process known as Chkdsk run to fix the corruption. The amount of time Chkdsk took to run was somewhat proportional to the number of files and directories within the NTFS volume. Thus smarter administrators sized NTFS volumes in a way that limited the maximum amount of files and directories within a given volume. For some corporations, this meant additional NTFS volumes with the associated management overhead. Starting with Windows NT4 and up to Windows 2008, Microsoft invested in efforts to reduce the amount of time it took to run Chkdsk. Further reducing the amount of time it took Chkdsk to run. In particular, this was done by reading NTFS meta data in bigger chunks and by better caching it, thus avoiding disk IOPS. Note that most of the time spent in Chkdsk is scanning the volume to detect issues, rather than in actually fixing the issues. This is where the time taken to run Chkdsk being proportional to the number of files & directories arises from. Scanning to detect errors is done while the volume is online and available. The volume is taken offline and the errors identified in phase C are corrected. This implies the volume is unavailable only for the duration taken to fix the errors logged in phase C.
In rare instances, the scanning determines that the corruption is too serious and needs a full offline scan, just as in Windows Server 2008 R2 and earlier versions of Windows. The item to note from the diagram is that the amount of time taken to fix a corrupted volume is now independent of the number of files and directories within the volume with one caveat. The caveat is that the corruption is not of an extremely serious nature – those still require the old style full scan while the volume is unavailable. Microsoft now supports NTFS volumes of up to 24TB in size with Windows 8 and effectively, the number of files and directories within a given volume may also be increased without fear of the volume being unavailable for a long time due to corruption. Full Chkdsk needed The errors are too serious to spot fix and an old style full scan with the volume being offline for a longer time is needed. Presumably this happens only rarely. Note that NTFS volumes are still “compatible” – you can take an NTFS volume created with prior versions of Windows and mount it on a Windows 8 system. You can also take an NTFS volume created with Windows 8 and use it with earlier versions of Windows.